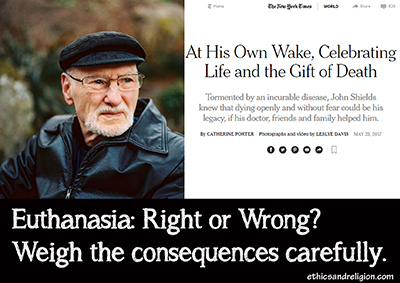 Ethics and Religion: June 8, 2017: Column 1866: Can Euthanasia Be Justified? John Shields knew he was near death at age 78, of a rare disease, amyloidosis. It is painful, so Shields, a Canadian living his last days in a hospice, decided to organize an Irish wake for himself, with music and booze before he died - to celebrate with friends. After the wake, he intended to die swiftly and peacefully by lethal injection, administered by his doctor. Last June Canada legalized what it termed "medical assistance in dying" for competent adult patients who are near death suffering intolerably from irremediable illnesses. His doctor, Stefanie Green, informed him that he qualified. "Having control over the terms of his death made him feel empowered over the disease, rather than crippled by it," The New York Times reported in a front page story on May 28. "Mr. Shields believed that dying openly and without fear could be his most meaningful legacy - which was saying something. He had been a civil rights activist, a social worker for children, the head of a British Columbia's biggest union, and most recently, the savior of a foundering land trust that included 7,191 acres of protected wilderness." Since arriving at a hospice on a stretcher, he had not left his bed for 17 days. In conversation, he lasted only 15 minutes before his eyes fluttered closed. He had led several different lives. He began as a Catholic priest, but was forced out when he challenged the pope's opposition to birth control. He became an activist in the civil rights movement, married, and became President of the British Columbia Government Employees Union, which grew by more than 20,000 members to 58,700 under his leadership. He was proudest of securing equal pay for women in the union. His wife became ill and died in 1999. He was still grieving his wife's death in 2005 when he met a woman who later became his second wife. A year and a half ago they were driving in Vancouver when he blacked out. They crashed. He broke his back in three places and she suffered five broken ribs. A biopsy of his heart taken after the accident revealed that he had amyloidosis, which caused his heart to stop beating. The disease would likely cause him to lose all feeling and basic use of his arms and legs before shutting down his heart. After his diagnosis, Shields retreated into his study and fell into grief. As someone who treasured his independence, the concept of being trapped in his own body frightened him. He searched the internet for what he called "life-ending cocktails." That's how he came in contact with Dr. Stephanie Green, who had spent years delivering hundreds of babies. She wanted a change in her life and attended a conference on assisted suicide. Most doctors have refused to participate, because it violated their Hippocratic Oath, "to do no harm." Christian doctors in Ontario are suing their professional colleagues. Dr. Green explained her shift to euthanasia with strange words: "Birth and death, deliveries in and out - I find it very transferable. Both are really intense and really important." Canadian law says participants must be adults in an advanced state of a "grievous and irremediable medical condition." Their suffering must be intolerable and their natural death "reasonably foreseeable." Vancouver Island is a retirement community where 80 people chose "medical deaths" in the first six months of the law. Across Canada 803 did so. On March 23 at 6 p.m., friends gathered in a solarium where there were bottles of a local Shiraz, with "Rebellion on Your Own Terms" on the label. There were bowls of fruit and a chocolate hazelnut cake. People arrived with flowers and instruments. At 8:12 John Shields was wheeled in sitting on a giant humming airbed. When presented with his plate of Swiss Chalet chicken, he asked, "You think I'm only going to have one portion?" Everyone laughed. Then many offered proclamations of love, admiration and gratitude. They thanked him for opening his door when they were broken hearted. As a former priest, he offered his blessings. In letters to the editor, after the story appeared, Dr. Ronald Pies wrote that In the Netherlands, 66 psychiatric patients were euthanized, "despite disagreements." He noted that in 2015 the World Medical Association stated, "Physician-assisted suicide, like euthanasia, is unethical and must be condemned by the medical profession. However, the right to decline medical treatment is a basic right of the patient." If doctors can kill patients, is this the first step for families to kill their elderly? Most patients lack the charm of Shields, and face frightening prospects.